A wonderful gift to welcome a new forever friend. 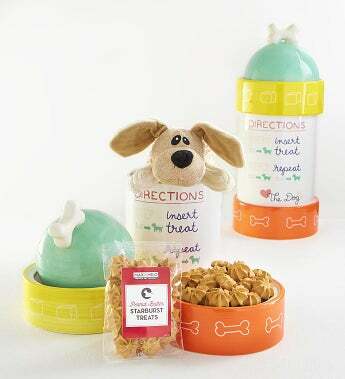 Gifts for pooch don't get much cuter than our 4 piece ceramic fire hydrant treat jar with lid. This adorable gift includes two ceramic doggie bowls, "Keep Ice Cold" water bowl, "Place Steak Here" food bowl, a ceramic treats container, a plush and burlap doggie toy with rope and scrumptious all natural US made peanut butter starburst treats. Plush & Burlap Dog Toy 10"